Use this infographic to learn about rooftop fall hazard protection for general industry. Will you be ready when disaster strikes? This infographic will help you prepare for potential emergencies at your business. Three new federal requirements for pesticide worker safety take effect in January 2018. This infographic breaks down the changes and whether the new worker protection standard (WPS) will apply to you. 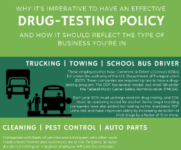 Does Your Drug-Testing Policy Reflect Your Business? Do you have an effective drug-testing policy? This infographic shows how your policy should reflect the type of business you are in. Register for our webinar to learn more: Medical and Recreational Marijuana at Work: Multi-State Updates for Mastering Emerging Compliance Obligations. Infographic: How Does Your Safety Culture Stack Up? Are you building a safety culture at your facility? If so, avoiding these five mistakes can save you time and resources, and make your program more successful. Did you know April is Distracted Driving Awareness Month? 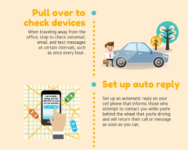 Safety.BLR.com, our partner site, created an infographic highlighting 5 simple steps to help you become a safer, more focused, driver.